Air Quality | Bloomfield Cooling, Heating & Electric, Inc.
Dust and dirt in the air can cause allergies and respiratory irritation. There’s no need to put up with that when you have a newer HVAC system installed. Bloomfield Cooling, Heating & Electric provides air quality solutions when we install new systems or upgrade existing ones. This is an in-duct air purifier that brings indoor air quality (IAQ) technology to a very high level. It purifies every cubic inch of air that your central air conditioning system reaches in your home by producing ionized hydrogen peroxide molecules that break down contaminants in the air upon contact. This device eliminates odors, allergies, and “sick building syndrome” caused by three types of indoor air pollutants: particulates, microbes, and gases. The REME HALO is installed into your system’s supply plenum and re-creates Mother Nature’s air purification process to rid your home’s indoor air of common allergens such as mold spores, dander, dust, smoke, and pollen. It proactively sweeps through your home to eliminate odors from cooking, dirty laundry, smelly pets, musty rooms, and mildew-ridden basements and attics. This whole-house germicidal ultraviolet (UV) light is installed directly inside the central air system (like the REME HALO) and eliminates microbes and odors as air cycles through the system, improving indoor air quality. It also extends the life of your system and reduces energy and maintenance costs by keeping the coils free of unwanted contaminants. 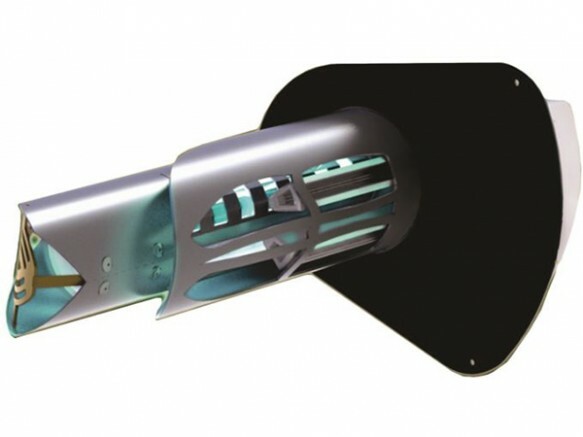 The Blue-Tube UV sterilizes biological contaminants such as mold, germs, and viruses that are in the air and on your HVAC system’s surfaces, using low-voltage UV light as a germicidal that disinfects your system. It actually scrambles the microorganisms’ DNA, which then prevents them from reproducing. Most systems have a built-in air filter which removes dust and dirt from your home and create a more comfortable, healthier indoor environment. With many adults spending up to 90 percent of their time indoors, this becomes a very important issue, not to mention the health and well-being of young children. To maintain the best health for your indoor air (and your family or building occupants) it’s important to keep your system’s air filter clean or change it when necessary—not only for your family’s health but for the health of your heating/cooling system as well. That’s because a dirty air filter can reduce your equipment’s performance and cause it to work harder to produce the same amount of energy. Our installers will go over this routine maintenance task as part of our service, or our service technician will show you where the air filter is located and how to clean or change it as part of a service call. Bloomfield Cooling, Heating & Electric sells, installs and services Carrier equipment, the best available. We offer a variety of air filtration solutions based on your needs and budget. All are superior products that deliver cleaner indoor air. Infinity Air Purifier – Carrier’s premium air filtration solution, this is the industry’s only air purifier that not only captures airborne mold spores, bacteria and viruses, but actually kills them as well. The Infinity Air Purifier is able to capture airborne particles as small as .01 microns to deliver the best air quality. It outperforms popular portable air cleaners and typical whole home electronic air cleaners by far. It is also simple and convenient to use because it eliminates the need for monthly filter cleaning; just replace the removable media once or twice a year. Performance Series Electronic Air Cleaner – Carrier’s electronic air cleaner traps airborne particles that are more than 600 times smaller than the point of a pin. This extra-effective air cleaning option is easily more efficient than media-type filters at both cleaning the air and allowing proper airflow. Comfort Series Media Filters – Carrier’s most affordable solution provides better filtration than standard furnace filters with more convenience. Simply remove and replace the filter cartridge one or two times per year. 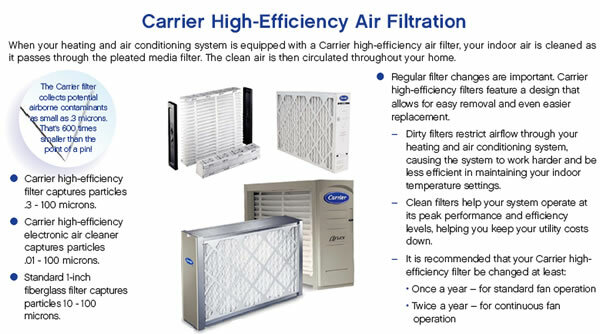 Have questions about these Carrier air filtration products? Just give us a call to review your options.